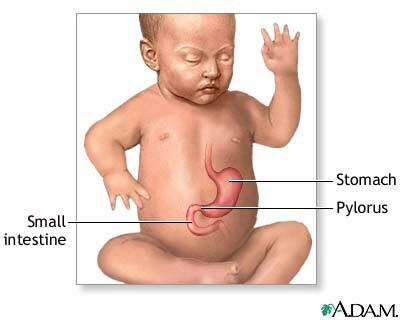 InterActiveHealth Medical questions What Really is Pyloric Stenosis and Why Did it Affect my Child? Our child recent underwent surgery for Pyloric Stenosis. We were shocked by the news that our baby was sick. We are hopeful that this will help. Can you please get out the news. Pyloric Stenosis is an interesting and well understood condition. It affects boys much more than girls. In fact, it often affects the first born males almost 4 times more than others. I am not sure if that is the case from our email reader. But it something to think about. When you have your well child check ups – this is something that is often looked for. It “develops” in the first six weeks of life. Sometimes it can be seen in older children, but this is unlikely. The presenting symptoms is often projectile vomiting. Of course, projectile vomiting can happen in several other diseases – but this needs to be considered each time. An exam will happen and a mass can be felt in the abdomen in most cases. The word “mass” is often never a good sign. In this case, the mass comes from the functional problem of this condition. Stenosis means narrowing and Pyloric often refers to the stomach and means gate. In this case therefore – a narrowing of the gate is occurring. The location is near the end of the stomach and the Small Intestines. Food enters the stomach and gets broken down. Some digesting of the food happens in the stomach, but more digesting happens in the intestines. In infants with pyloric stenosis – the food can’t pass from the stomach to the intestines and it therefore is vomited back out the mouth. It needs to go somewhere. A muscle that helps with the closing of the Stomach when empty becomes quite enlarged. This muscle does not allow for the complete opening of the stomach into the intestines. This portion of the intestines is known as the duodenum. AS the muscle thickens – the opening becomes smaller and smaller. The real concern of this condition is malnutrition and dehydration. As both consequences advance, serious complications can be seen by the infant. Loss of weight, abdominal pain, food hungers, crying can be seen. The treatment of this condition is Surgery. A 3-4 cm incision used to be the treatment of choice. Now, laproscopy is the preferred treatment. IV fluids will often be given prior to and after surgery. A child may remain in the hospital for 1-2 days – more if a complication is experienced. Recovery is often seen. The main question about this condition is cause. Functionally – an enlarged muscle is the answer. But, an exact cause is often unknown. Genetics is a likely cause and some see Erythomycin given in the first month of life as another cause possibility. It is believed that a baby is not born with the condition but develops it early in life. 0 Responses to What Really is Pyloric Stenosis and Why Did it Affect my Child?